Historically speaking, the first coining of Web 3.0 in conjunction with Semantic Web and/or AI agents and the first coining of Web 3.0 in conjunction with Wikipedia and/or Google was made in the Wikipedia 3.0: The End of Google? article, which was published on Evolving Trends (this blog) on June 26, ‘06. As of Jan 25, there are 11,000 links to Evolving Trends from blogs, forums and news sites pointing to the Wikipedia 3.0 article. According to Alexa the Wikipedia 3.0: The End of Google? article estimated penetration peaked on June 28 at a ratio of 650 per each 1,000,000 people. Based on an estimated number of 1,000,000,000 Web users, this means that it reached 650,000 people on June 28, and other hundreds of thousands of people on June 26, 27, 29, 30. This includes people who read the article at about 6,000 sites (according to MSN) that had linked to Evolving Trends. 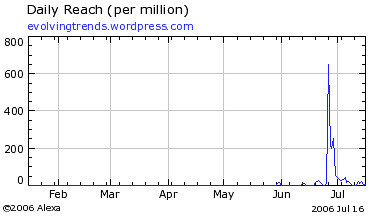 Based on the Alexa graph, we could estimate that the article reach close to 2 million people in the first 4.5 days of its release. Update on Alexa Statistics (Sep. 18, 2008): some people have pointed out (independently with respect to their own experience) that Alexa’s statistics are skewed and not very reliable. As far as the direct hits to the on this blog they’re in the 200,000 range as of this writing. Note: the term “Web 3.0″ is the dictionary word “Web” followed by the number “3″, a decimal point and the number “0.” As such, the term itself cannot and should not have any commercial significance in any context. The above mentioned Web 3D + Semantic Web + AI vision which preceded the Wikipeda 3.0 vision received much less attention, which I think is partly because, unlike the Wikipedia 3.0: The End of Google article, this article was not framed in the same controversial manner. This was noted as the biggest flaw of social bookmarking site digg which was used to promote this article. The idea described in this article was adopted by Hakia after it was published here, so this article may be considered as prior art. This post provides the history behind use of the term Web 3.0 in the context of the Semantic Web and AI. This post explains the accidental way in which this article reaching 2 million people in 4 days.